A credit score is more than a number. It represents your credit performance but there’s more. The information that affects that number is a road-map you use to improve your score. You can start to change things. If you want to know what your score is, you can get that information from any one of these credit score services: : TransUnion, Equifax, Borrowell, and CreditKarma. Some offer a free trial so you can, at least, get some information. 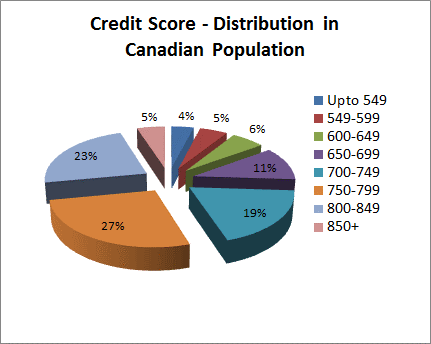 Equifax, TransUnion, Borrowell, and CreditKarma offer credit score information. To appreciate the scores, the following infographic shows you the criteria used to evaluate your score. It is important to note that payment history is a dominant factor. To some degree, this is common sense. When the money does not flow back to the lender consistently, then other factors will definitely not help shift the opinion of lenders. A poor payment track record amplifies you as a risk. The credit score range and what it means. The credit score gauge ranges from 300 to 850. Here’s how that range breaks down. Less than 350. This means you don’t have a credit history. So, relax. You’re simply not on the grid yet. Less than 600. This is not just a bad credit rating, it is considered a very bad credit rating. Any number bellow this threshold means you could use support and that some financial problems are chronic: many missed payments, foreclosure or repossession, bankruptcy and high balance on your credit cards. You will have trouble getting personal loans or a credit card and, if you do, interest rates will be very high. If you are not already bankrupt, the signals may be telling you to consider it. Less than 650 and above 600. As this threshold, the “very” is dropped from the bad credit rating. Although you’re still in dark woods, you are in a better position to dig yourself out, especially if you are closer to 650. If your number is in the 650 range, then you are more in line with the national average, which is a compelling snapshot of the Canadian debt condition. Less than 700 and above 650. This is a “good” credit rating, the kind of “good” that sounds like your significant other saying you look “fine” but not inspiring. The banks will see you as a risk, but not to the point of showing you the door. However, you will more than likely face higher interest rates. Less than 750 and above 700. You get a silver star. You have managed your credit consistently without major credit issues. Missing a payment every now and then has not torpedoed your standing. Above 750. We all wish we could be there. You will get just about anything you want within your financial capabilities. The national credit score average is 650. Statistics show that the larger chunk of Canadians find themselves generally in the good to excellent range. Go, Canada! What does it take to improve your credit score? Well, first of all, find out what your score is. The first, immediate step one can take is to fund errors and get them corrected. Believe it or not, an error in an address or a misspelled name can negatively affect your credit score. An error in an address or a misspelled name can negatively affect a credit score. The two, most effective, long term things you can do are to stop missing any payments and start paying off credit card debt. Of course, this probably means an adjustment in how you manage finances generally, like not making unnecessary purchases and applying a stricter budget in terms of monthly expenses. A tip: Pay off the smallest debts quickly while making minimum payments on the larger ones. First thing’s first——-get your credit score! And remember, numbers can change.